Congratulations Huehnebeins for the FTF! Take a picture of yourself AND your GPS with the sign at the entrance (pictured at the bottom of this listing) and post it with your log. Email (DO NOT MESSAGE ME) me the answers to the following questions (DON'T put the answers in your log). How many chambers are in the cave? What is the "interesting", and maybe infamous, formation that is lit by pink or red lights? NOTE: This is not a lake but a specific stalactite or stalagmite. 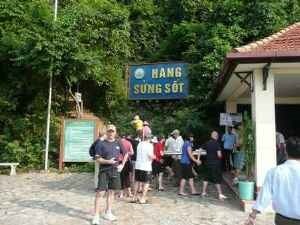 What type of cave is Hang Sung Sot? Email (DO NOT MESSAGE ME) me the answers . Any log that does not meet these requirements will be deleted. 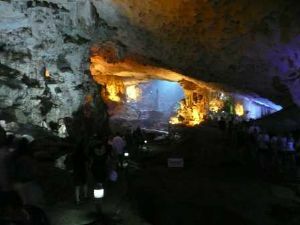 Hang Sung Sot is a beautiful cave located in Ha Long Bay, northern Vietnam. It was discovered in 1901 by the French, named in 1938 by the French (Cave of Surprises) and welcomed its first visitors in 1993. In 1994, Ha Long Bay, where the cave is located, was inscripted as a UNESCO World Heritage area. 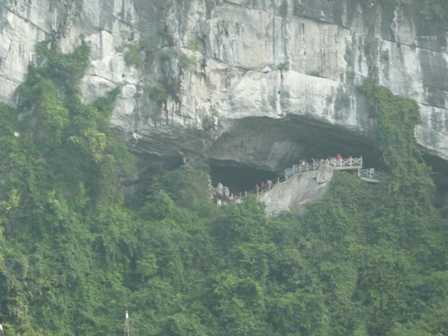 The entrance is high above the bay on Bo Hòn Island, one of the 1,969 limestone monolithic islands that are topped with thick jungle vegetation. Ha Long Bay has experienced at least 500 million years in the various geological states of orogeny (mountain building), marine transgression (where the sea level rises and covers land masses) and marine regression (where the sea floor is exposed above sea level). All of these phases contributed to the development of Cave of Surprises and the other caves in the area. From 570-420 million BC, the Ha Long Bay area endured severe rains and flooding. In addition, the area was subjected to constant activity of the tectonic plates that created mountains deep under the water. After this period and until 240 million BC, the region was subjected to a very hot and dry climate along with the powerful forces of erosion and the Ha Long area emerged from under the sea and a limestone layer more than 3000 feet thick was formed. During the period from 67 million to 9,000 BC, a mountain forming and erosion phase produced the mountains and the Ha Long depression that is seen in the area today. During this phase, 68,000-9,000 BC, the caves of the area were formed. Water seeped through cracks and eroded holes in the limestone. These holes allowed more water in, the erosion increased and the caves grew bigger. As some of the water seeped down to the cave ceiling, it slowly dripped and deposited sediment creating stalactites (formations that hang from the ceiling) and stalagmites (formations that rise from the floor) and other formations in the caves. From 9,000-1,000 BC, the sea advanced and its effects can be seen on the ceiling of the caves in the form of an interesting ‘wave’ effect. The most remarkable geological events of Ha Long Bay’s history in the last 1,000 years include the advance of the sea, the raising of the bay area and the strong erosion that has formed coral and pure blue and heavily salted water. A cave or cavern is a natural underground void large enough for a human to enter. The formation and development of caves is known as speleogenesis. Caves are formed by various geologic processes. These may involve a combination of chemical processes, erosion from water, tectonic forces, microorganisms, pressure, atmospheric influences, and even digging. Most caves are formed in limestone by dissolution. These caves are formed at the same time as the surrounding rock. 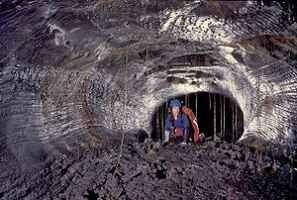 Lava tubes are formed through volcanic activity and are the most common 'primary' caves. The lava flows downhill and the surface cools and solidifies. The hotter lava continues to flow under that crust, and if most of the liquid lava beneath the crust flows out, a hollow tube remains, thus forming a cavity. Lava tubes are not the only type of cave formed through volcanic activity. Other types include rift caves, lava mold caves, open vertical volcanic conduits, and inflationary caves. Solutional caves (also known as Limestone or Carst caves) are the most frequently occurring and the largest caves. Such caves form in rock that is soluble, such as limestone, but can also form in other rocks, including chalk, dolomite, marble, salt, and gypsum. Rock is dissolved by natural acid in groundwater that seeps through bedding-planes, faults, joints etc. Limestone dissolves under the action of rainwater and groundwater charged with H2CO3 (carbonic acid) and naturally occurring organic acids. 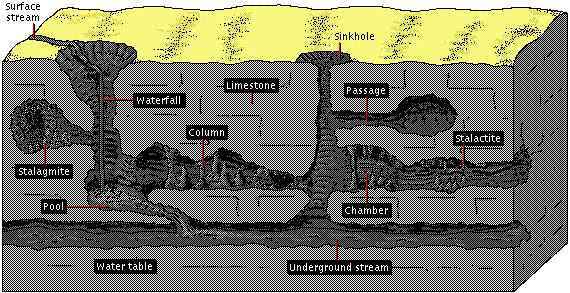 The dissolution process produces a distinctive landform known as karst, or a sinkhole and underground drainage. 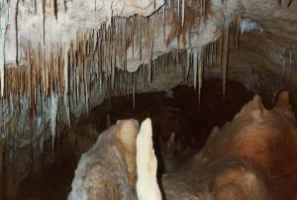 Mineral deposits such as flowstones, stalactites, stalagmites, helictites, soda straws and columns (a connected stalactite and stalagmite), called speleothems, are prevalent in these caves. These are calcium carbonate formations produced through slow precipitation, or dripping water. 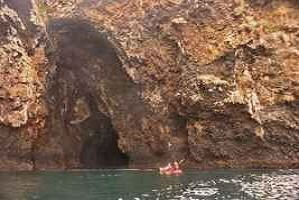 Around the world, caves can be found on coastlines. Caves that are formed by the wave action on weak sea cliffs are called littoral or sea caves. Some wave-cut caves are now above sea level because of later uplift. In addition, solutional caves have been flooded by the sea and are now subject to littoral erosion. Erosional, or crosional, caves are formed entirely by running water that can carry rocks and other debris. The cave erosion is usually caused by a fault or joint in the rock that acts as a guide for the water. 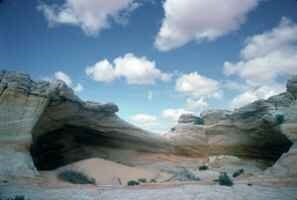 Another erosional cave is formed by wind-borne sediments and are called Aeolian or wind caves. Solutional caves can be subject to erosional enlargement when streams pass through them. Glacier: Caves that form in ice and under glaciers and are formed by melting. Fracture: Caves that are formed when softer rock dissolve from between harder rock. Talus: Caves that have formed as the result of rocks falling into a pile; usually at the base of a cliff. Anchihaline: Coastal caves that are formed by the combination fresh and saline(salt) water. The terrain is a 5 since you have to take a boat or some other transportation out to the cache. 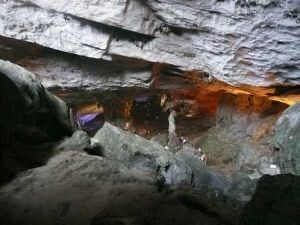 Most, if not all, tours that bring you to this location have entry to the cave included in the price.